Neatly groomed hair might not be a priority when backpacking, but most of us need a haircut once in a while. So where’s a good place to get a haircut in Hanoi? The most interesting option is to stop at one of the roadside barbers scattered throughout town. 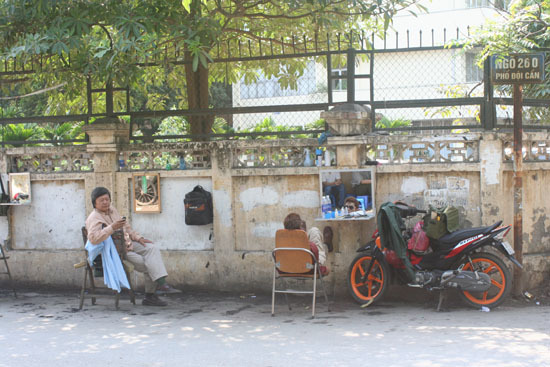 I’ve not seen many in Hanoi’s Old Quarter — the pavements just aren’t wide enough for them to set up shop — but away from the 36 streets they’re not difficult to find. I can’t recommend anyone in particular, so you’ll be taking a bit of a risk, but if you’re a man and you just want a quick trim or a shave they’ll do the trick. By the way, I’m not suggesting that men have less demanding needs when it comes to haircuts, but I’ve never seen a woman having her hair cut by a street barber, so wouldn’t recommend it. Prices are variable, depending upon the experience and fame of the barber and whether you’re a regular or new customer. Locals will pay anything from 15,000 to 50,000 VND — you should expect to have to pay a bit more but negotiate if they’re trying it on. If you don’t want to become a tourist attraction by having your hair cut on the street, plenty of off-the-street barbers are dotted around the city. Look out for “Cat Toc Nam” (male hair cut) signs. Prices can be comparable to on the pavement, though start at around 30,000 VND. My boyfriend goes to one around the corner from our house: results are variable but always decent. He pays 30,000 to 50,000 depending upon who’s cutting it. Check prices first. The final result might not be significantly better to a pavement cut, but it’s a bit more private and the more expensive places will even wash your hair (some offer additional services for men so choose carefully if you don’t want to be chasing off the girls). As is usually the case, women will have to pay more than men — I’ve been reliably informed that it’s possible to get a decent enough cut for 100,000 VND, but you can pay a lot more. Unfortunately though even the expat recommended places are not without risk: hairdressers here don’t seem to have the level of skill you’d expect from even a cheaper hairdresser back home. But if you are happy to spend around $10 for a cut, or are looking for a colour, you might want to try one of these places: Dinh Hair Salon, JusT.in.M Hairdressing, or Tran Hung Hair Creation. All speak English and have experience of Western hair — Asian and Western hair differs apparently — so they know what they’re doing, but they just need a bit more guidance, for example regarding how much you want cut off. If you say “Take off whatever you think it needs to tidy it up” you will probably find they go for the minimum. In summary, Hanoi’s no worse a place to get your haircut than anywhere else, and if you’re a guy with simple needs there are plenty of cheap options. Girls will have to pay a bit more.